Time flies when I am having fun! When I pulled out Jeeves & Wooster from the secret envelope that tells me what I am watching next, I thought that’s great. I had only watched and wrote about the first episode only a couple months back so I was very much looking forward to this. I thought I maybe did an article in April or something but when I looked back, I couldn’t find anything. After doing a little more research did I only then realise that I wrote the article way back in September of 2012 as part of my month long theme of first episodes. I know it is not very interesting but I do find it funny how there are some programs that I remember vividly when I publish an article and others that I am way off on. It’s been a crazy couple of months around here. There is a lot going on some cool and some not so cool. 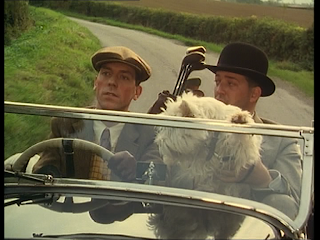 If there was ever a time to need a dose of Jeeves & Wooster, that time would be now. This series has even a worse identity crisis than ‘Allo! ‘Allo! when it comes to episode names. For this episode alone it is also known as, Tuppy and the Terrier, The Dog McIntosh, Bertie Is in Love, and Golf Tournament. In my database I have this episode in there as Bertie Is in Love and I decided to use the title in the Kaleidoscope book as the one for this article. Who knows what is right. 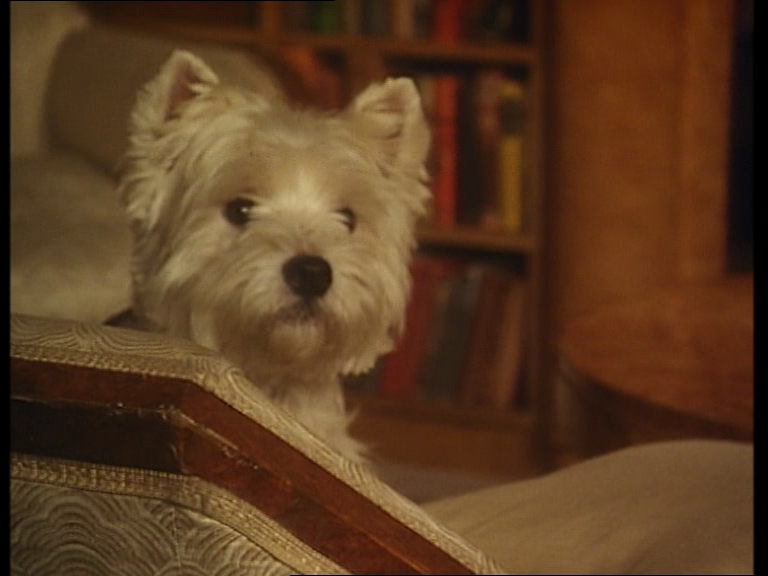 For poor old Bertie, his Aunt Agatha is off traveling and has left her dog McIntosh with him. McIntosh is adorable and is not overly troublesome but he will soon be for Bertie. 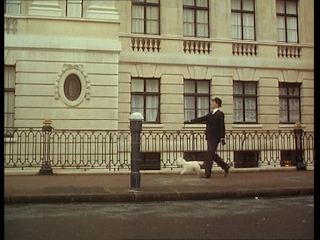 There is a great shot at the beginning of the episode with Jeeves walking McIntosh down the street going to Bertie’s flat. Jeeves is so prim & proper while McIntosh isn’t looking too bad himself! 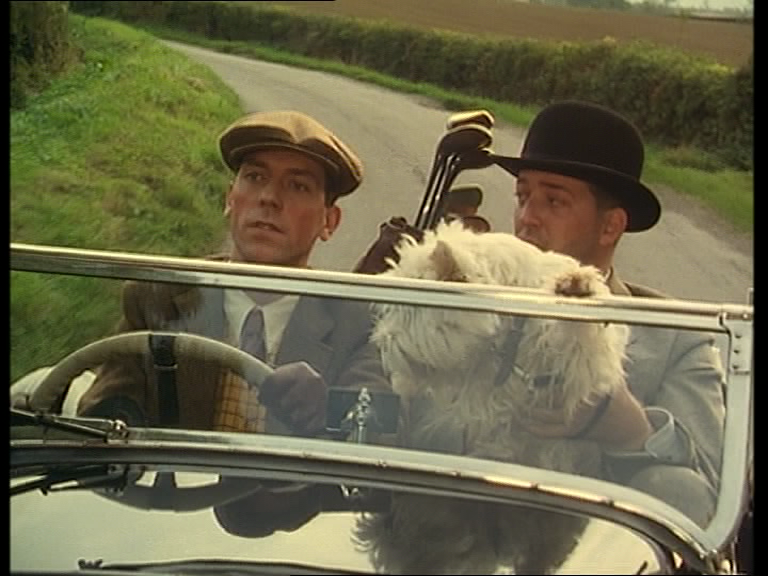 Bertie and Jeeves take the car (with McIntosh) and are off to the country for a round of gold with some of Bertie’s friends. Among them is Bobbie Wickham. Bertie is absolutely smitten with her and wants to ask her to marry him. Jeeves is not as sure as she can be frivolous. To Bertie, there is nothing Frivolous about Bobbie. The golf game begins with Barmy (I love these names) showing off a timer that he can attach to his golf club driver. When he starts his swing, he keeps the club above him until the timer goes off at which point he can begin his downward swing. It works like a charm for him. Now it’s Bertie’s turn. Bertie doesn’t need any device to help with his golf game. He will rely on his own skill. The only problem is, every time he begins his swing McIntosh barks! Every. Time. Finally, Bertie really goes for it, of course McIntosh barks, and the ball slices into the refreshment stand. A truly laugh out loud moment for me! That night, there is a party at the Wickham house where Bertie and Jeeves are staying. 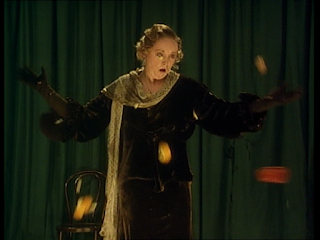 A concert is being given with a performance from the operatic singer Cora Bellinger. It is beautiful. So much so that Bertie’s friend Tuppy Glossop is now smitten with her. Of course, as I watch a lot of historical-set British television it is always amazing to see how the other half lived. Small private informal concerts with opera singers. These dinner parties are always so sophisticated which is actually a lot of the fun watching them! All of Bertie’s friends are aloof and as Jeeves points out quite frivolous. In fact, I would think that Bobbie Wickham is the least so, yet she causes an amusing joke. After Bertie was so humiliated at golf that day, Bobbie suggested that Bertie takes a large stick with something sharp at the end of it, sneak into Barmy’s room and pop his hot water bottle. Bertie sneaks down in the middle of the night to Barmy’s room, quietly opens up the door and pops the bottle under the covers in the bed thus soaking everything. Unfortunately for Bertie, McIntosh follows him down and barks at him as he tries to escape. Bertie gets so wrapped up that he can’t escape only to find that Barmy is not in the room but another couple. Bertie looks at the older gentleman and exclaims, “I thought you were Barmy!” The couple switched rooms with Barmy because their room reminded the woman of her old country. The older gentleman tells Bertie he can stay down in their wet room as they take his room. It is only in the morning that Bertie finds out that Barmy went up to his old room and popped his water bottle only to find that same couple is now staying in Bertie’s room. Quite simply, this was another laugh out loud sequence and one that very much put a smile on my face. With this was the last straw with Bertie in terms of his “love” for Bobbie. He is through with her. Back in London, Bertie is about to hand McIntosh back to Aunt Agatha. In his apartment, just like the first episode, Bertie is singing on his piano. This time it’s “47 Ginger-Headed Sailors” from 1929. McIntosh seems to like it. Bertie gets a telegram to see Bobbie about a luncheon she wants to hold in his flat. Now this really is too much. 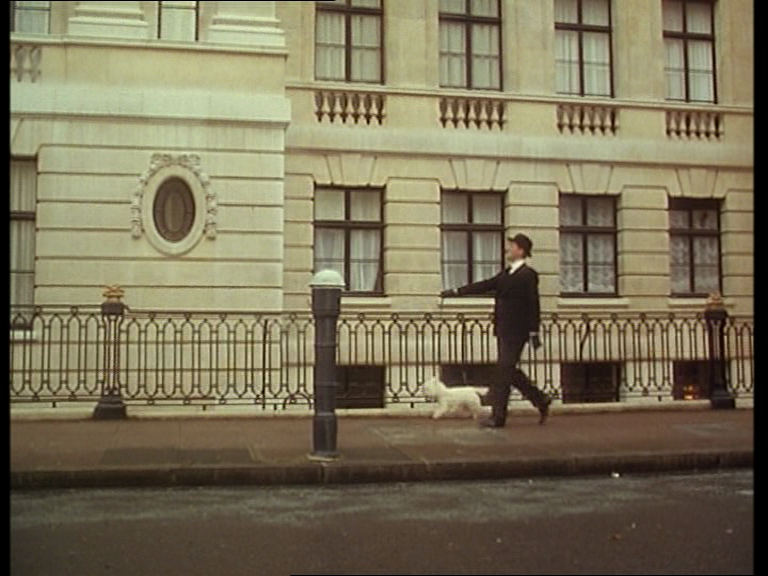 Bertie goes to see Bobbie at her family house in London. She explains that her mother wrote a play that they are trying to sell to a Broadway producer who is in town. They can’t have lunch at her place because the place is being renovated but she really needs them to have lunch at Bertie’s place. Bertie can hang out at his club while Bobbie reads the play (with Jeeves) to the producer and his young son. The Broadway producer believes that a Broadway audience is the same intellectual age as his son who is about 8. If his son likes the play then he will buy it. The son is OK with the play but loves McIntosh more. Bobbie gives McIntosh to the son of this Broadway producer. Bertie is outraged! Bertie is about to give this dog back to his aunt in a couple of hours. Of course, Jeeves has a plan. Bertie simply needs to go to the producer’s hotel while he is out and retrieve the dog. He does so and it goes surprisingly well. He gets McIntosh back where Jeeves promptly puts him into the bathroom. The Broadway producer shows up demanding to get the dog back. While Bertie is hiding from this producer behind his couch, he is amazed to see Jeeves give the dog back to the producer! After he leaves and before Jeeves can explain, Bertie takes off to try and get the dog back only to run into Aunt Agatha wanting to retrieve McIntosh. After pathetically trying to stop Aunt Agatha from going to Bertie’s flat, she gets up there for Jeeves to promptly hand McIntosh back to her. She leaves and Bertie is thoroughly confused. He clearly saw Jeeves hand the dog over to the Broadway producer! Jeeves explains that he took the liberty of buying a dog that looked like McIntosh and gave the look-a-like to the boy and the real McIntosh back to Aunt Agatha. The final act of this episode sees another aunt, Aunt Dahlia wanting Jeeves to help her to break up the infatuation between Tuppy and Cora. Tuppy has been really infatuated with her since the party in the country. So much so that Tuppy asked Bertie to join him at the opera where Cora was singing. They sit throughout the performance and come to the end of it with Tuppy clapping and whistling loudly suggesting him and Bertie go down to the dressing room and congratulate Cora. Bertie then points out to Tuppy that this is only the first intermission and there are 3 more after this. Jeeves has an idea. There is a performance that is done publicly that has Tuppy singing and in which Tuppy got Cora to agree to sing at too. Jeeves has a plan to get Bertie to sing a song before Tuppy which is Sonny Boy. Jeeves tells Bertie that if Tuppy sings that song immediately after Bertie the crowd will boo him and Cora will not want to see Tuppy anymore. Bertie gets up on stage and sings “Sonny Boy” to which the crowd is already strangely reacting to him angrily. Tuppy returns from the pub to sing “Sonny Boy” which the crowd erupts and starts throwing stuff at him. The plan worked except that Cora wasn’t there yet to see any of this. When Cora finally arrives, she goes on stage to start to sing. It’s “Sonny Boy” to which the crowd becomes irate! They throw everything they got at her. Eggs, produce, whatever they have. She leaves the stage but before she leaves the venue, she punches Tuppy in the eye. Jeeves managed to have “Sonny Boy” sang 3 times even before Bertie got up on stage. Jeeves told Cora that Tuppy really wanted her to sing “Sonny Boy”. It looked like Jeeves’ plan worked after all. Like all the episodes of Jeeves & Wooster, this is taken by the books of P.G. Wodehouse. I go into the all the various incarnation of the duo here. These 3 acts were taken from Very Good, Jeeves which was published in 1930. It was a collection of eleven short stories. All the stories in this episode tie nicely together with the only one that feels really tacked on is Aunt Dahlia showing up out of nowhere to ask Bertie to break up the relationship between Tuppy and Cora. Even odder is her requesting that they get Jeeves involved because he is really good at these sorts of things. It just appears where everything else blends nicely together. The episode was written by Clive Exton who also wrote episodes of Poirot and 10 episodes of Rosemary & Thyme. For whatever reason, I have never ever put together the way the Hugh Laurie plays Bertie and how he plays George from Blackadder Goes Forth. They really are the same character. It’s embarrassing for me that I have never thought of that before now! They both have the same air-headedness that makes him so loveable but extremely dense. George has the same kind of public school friends as Bertie would. George had the Trinity College Tiddlywinks while Bertie had friends with the name of Barmy and Tuppy. 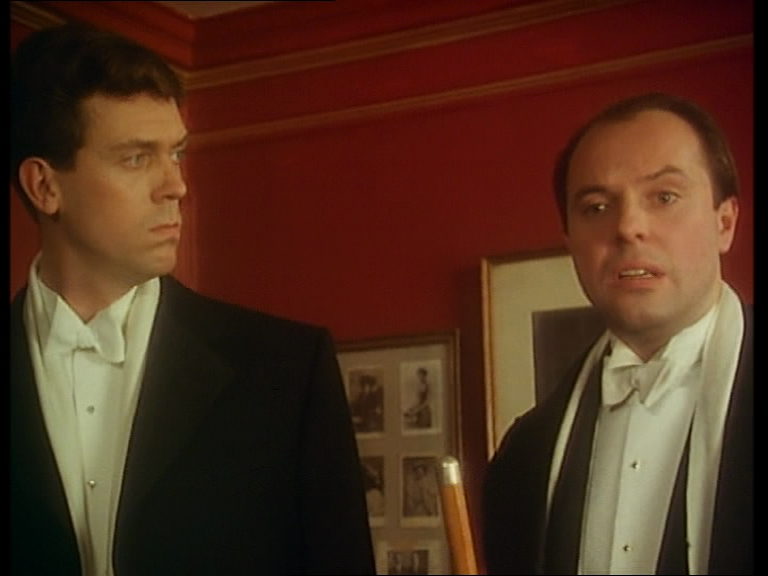 There is a grand innocence to Bertie & George that only Hugh Laurie could bring those characters. 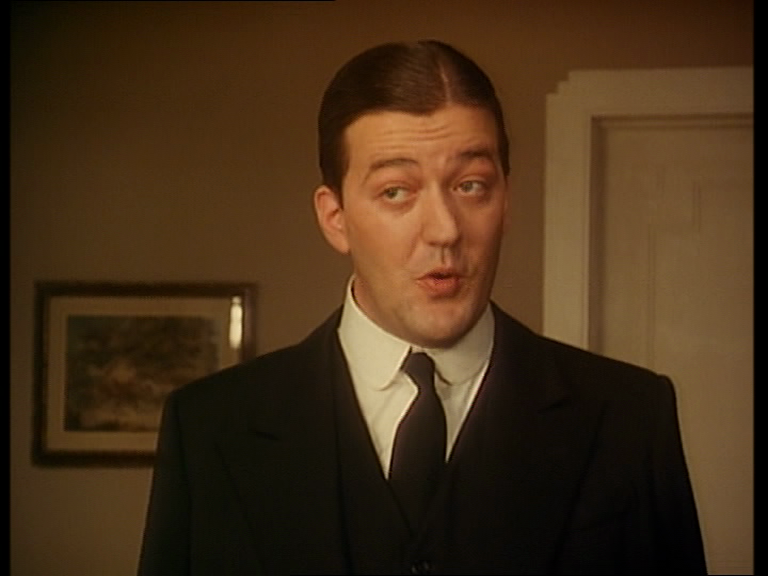 Throughout this episode, I kept wondering about the amount of screen time Stephen Fry had on this episode. It appears that Jeeves is always in the background, manipulating the situation. Jeeves is not necessarily high comedy like Bertie but does have the smugness of always having the upper hand. I think there is appeal in playing a character like that. 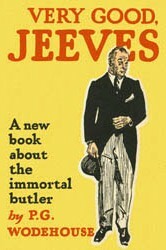 By the second episode, Jeeves’ reputation is getting around the family and he is looked at as some kind of problem solver. 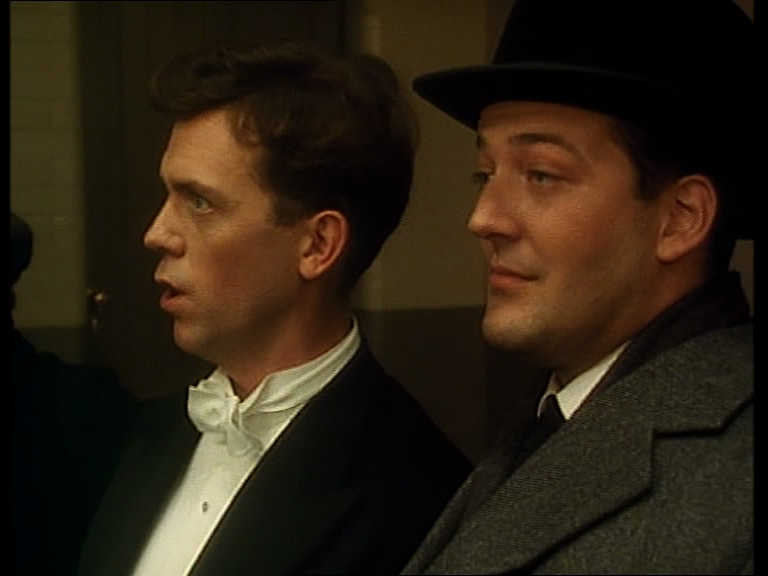 Like I mentioned before, Fry and Laurie to me are the definitive Jeeves and Wooster. I do not need to see any others. I watched this episode from the same Granada boxset I watched the first episode in September. I mentioned the transfer of the episodes looks good but I would like to revise that. They look alright. There is some kind of gold/yellow tint to everything. I am not sure if that is intentional or not. There are scenes that I think the look is quite comfortable with that tint such as scenes set in Bertie’s flat or his club. Others such as being out in the country don’t look as good. In my last article about Jeeves & Wooster, I put comparison shots between my Granada set and the R1 A&E set to show the difference. Did anyone else notice they looked the same? I think I was trying to make my bruised ego feel better. I had the first couple of sets of the A&E Jeeves & Wooster for a while but I bought the PAL R2 set because it was a good price and it said it was digitally remastered. As a reminder to everyone who is reading this: digitally remastered does not mean restored. It means it has been put onto a digital format. 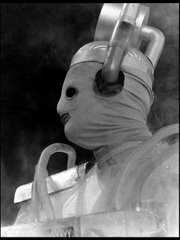 The original series was shot on 16mm film and mastered onto 1” video tape. If the original film elements still exist for this story with the footage re-transferred to HD and released onto Blu Ray, the result should be amazing. I sincerely hope this could be an option someday as this series would look absolutely stunning, especially that gorgeous opening title sequence. Do you ever find favourite series you watch as seasonal? You can watch the series any time but when you watch it during a specific season that it enhances you enjoyment? 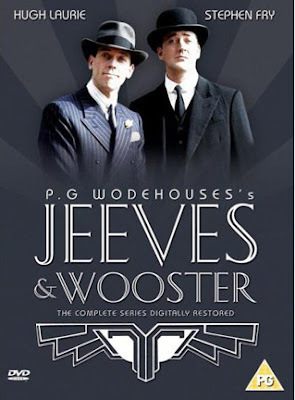 I feel that Jeeves & Wooster is a great summer series. The series has a nice open-air quality to it that I love to watch on a sunny warm day. Yes, it shows what a TV enthusiast I am. 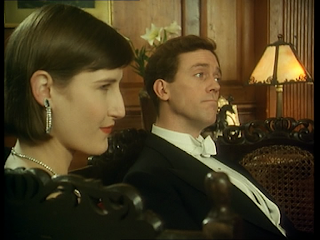 When you are outside in the nice warm summer air, I am inside watching Jeeves & Wooster. Next week: I take a look at some very archive television as I go back to the very first episode of Z Cars with Four of a Kind. I also will publish my review for the R1 only DVD release of Doctor Who: The Doctor’s Revisited. I love Jeeves & Wooster and could watch it anytime, but I certainly see your point about good summer viewing. If properly treated, I would certainly buy Jeeves & Wooster on Blu Ray. I started with the A&E vhs tapes and then got the Granada dvd set, so a triple-dip would not be out of the question if it was a decent upgrade.